I’m so bad, let me just confess right up front – I keep telling myself, start drawing in the late morning for good light. Well you know what I did right? End of the day and here I am trying to post the update in the dark. Majesty of Grace, #4 (6.25 x 8.5) is a graphite pencil using Strathmore Bristol Vellum paper. Today I used 2H, HB and 3B pencils, and a tortilum for spreading in tight places. I thought I’d be done today but I do see several areas that need lower values, blend for a smoother appearance and make the sea-foam tails more believable – then I think the drawing will be finished. Oh I know I have a tendency to fuss with a drawing, but in this case the sea is still talking to me, so don’t you know I’ll be listening. I may try to paint one more snow scene tomorrow morning, but tomorrow marks our 27th wedding anniversary and well, my attention will be elsewhere. Have a wonderful weekend. Hi Madhu, thank you for your lovely comment – so sorry I didn’t see earlier. Happy New Year to you! Thank you Amy! If you find you’re not receiving my posts in your Reader, I have found if you un-follow and then re-follow the Reader will reset itself. It happens to me and through trial and error I found this works. Thanks again! I like your pencil work … but more importantly, Happy Anniversary and cheers to 27! Thank you Frank, really appreciate your comment and wishes!! Happy Anniversary Mary! And morning or night, no matter what the light, your paintings are gorgeous. Hi Dorann, thanks very much for your greeting – you know how to make my day. When the sea talks, you just have to listen! Congratulations on the wedding anniversary, Mary! Thanks Christy for your kind comments and yes, I’m still listening to the sea. Appreciate your lovely wishes – have a wonderful weekend. Happy Anniversary Mary!!! I love “Majesty of Grace”! Your sea foam is outstanding, but the wave is awesome!!! I can hear the roar of the wave crashing against the shore. Oh how I miss the ocean. You bring back such fond memories for me with your beautiful art, of when I lived in So. Cal. Have a fabulous weekend!! Hi Rhonda, thank you very much for your kind wishes!! And, for your beautiful comments on the wave – its been a real pleasure to draw! Thank you Gallivanta for your wishes!! Secondly, this is really lovely! My favourite kind of seascape and I have no idea how you achieve it. Happy weekend to you! Hi Jo, thank you very much for your well wishes, I really appreciate it! Thanks for your feedback on the wave, it’s a great subject to render in pencil – just love working it and watch it change under the pencil. Happy weekend to you as well. Congrats on your anniversary! Best wishes for many more years of happiness to come! Thank you so much for your lovely comments and well wishes – I can’t tell you how much I appreciate it! Whoa .. this is really coming along Mary ! Thanks Poppy! The sea continues to evolve, but we are close to the end – thank you for your feedback. You are so kind, appreciate the well wishes!! Have a great weekend. Thank you John for your lovely wishes! Happy anniversary Mary. That wave is so good. I’m amazed at the effects you get with pencils. It looks pretty fierce. Thank you Don for your well wishes, much appreciated! 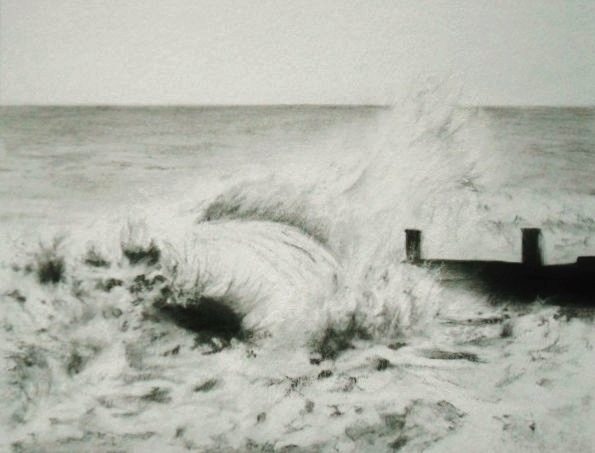 Thanks for your generous comments on the wave – the pencils are a great medium for rendering the sea. Looks amazing to me Mary! And happy anniversary. Thank you Karen for your kind words and wishes. Have a wonderful weekend. Happy Anniversary! What a wonderful thing to sustain a marriage that long…you’re right up there with me (we just past 28) so I definitely know how much work and toil goes into that…..like the painting that never gets finished, huh? Congrats! Hi A! Thank you for your lovely comments and well wishes – congrats on your 28th. I understand, we fortunate – a beautiful thing. Have a wonderful weekend. Love how the wave starts folding over, is perfectly executed Mary and I’m pretty sure all of us think the same way: something more needs to be done or added, corrected, worked on so no pressure… you most enjoy your anniversary, 27 years of marriage is a beautiful thing so congratulations to you both and wish you many more to come! Have the most wonderful time! Hi Eva, thank you so much and glad you are enjoying a view of the sea from Texas! So funny, but I do love drawing it. There are a few areas that don’t quite read right, so a couple of touches here and there . . . Thank you for your lovely well wishes – as I told Cynthia, made some chocolate mousse today for the special celebration. Have a beautiful weekend. Chocolate mousse sounds delicious, hope you had a very romantic celebration! Wish you as well a wonderful weekend. You are too funny, Mary….it gets dark here at about four o’clock these days! The drawing is lovely…take a break and celebrate…congratulations, love, and many more good years! Thank you so much Cynthia for your thoughts and comments, always heartfelt and beautiful. I know it does get dark earlier back East, I do like the extra hour we have of sunlight – even though it’s not the best for photographs. Thank you for your wishes – made homemade Chocolate Mousse today, light & fluffy (I tried a spoonful, oh my I could have eaten it all!!). Thank you and so appreciate your generous spirit ~ have a lovely weekend. So beautiful Mary the texture is amazing and the color is perfect it looks like a black and white photograph. Congratulations on 27 year of marriage wow! Thank you so much Doris – great to see you. Really appreciate your feedback, I was able to achieve the texture with a painters’ knife, scraping the paint off the OPs stick and sliding/dragging it across the surface (a lot of fun). Thanks on #27!